I am a lazy baker so any dish where you don’t fuss over beating things and sifting things is my kind of baking. 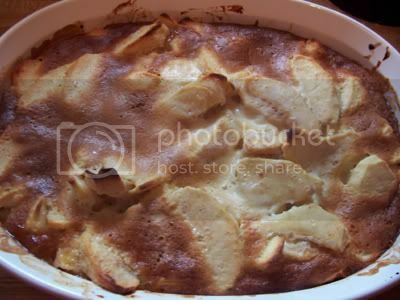 I didn’t want to be bothered with pie crust so I thought I would just dump things in a dish and bake; that’s how I came up with this concoction which is a combination of a Clafoutis recipe from Essential Desserts and a French Apple Cobbler recipe from Southernfood.about.com. Preheat oven to 350 degrees F. Combine filling ingredients in a bowl and mix well. Pour into an oven safe baking dish. Combine all topping ingredients in a bowl and mix until smooth. Pour batter over the apples in the baking dish and put in the pre-heated oven. Bake for 45 to 60 minutes until the apples are tender and crust is golden brown. Serve with additional heavy cream drizzled over the top if you prefer. hey munchkinmom, we liked this a lot. It was like a deconstructed apple pie. Great with vanilla ice cream, and even better the next day!